Canon has announced a firmware update for its EOS 7D camera adding a couple of very nice features to existing cameras. An increase of the maximum number of burst images taken in the RAW file format from 15 to 25 frames. When shooting in RAW+JPG, the maximum is now 17 and with JPG-only, 125. The ability to process RAW image files directly in the camera. This includes adjustment of exposure compensation, white balance, picture style, noise reduction at high ISO speeds, distortion correction, and other processing parameters. The thus processed RAW files will be saved as a separate JPG file, keeping the original intact. Ability to rate images in-camera. Ability to resize JPG files in-camera. Faster scrolling of zoomed-in images. An option to set a maximum ISO setting in ISO Auto mode. Fine adjustment of the audio level (up to 64 levels) prior to video recording. Support for the new optional GPS Receiver GP-E2. Customisation of the first four characters of the image file name, useful to e.g., store your initials. 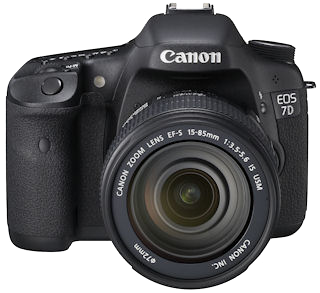 The new firmware is to be released in August and can then be obtained from the Canon website.